Through the new Washington Public Lands Defense Network and partnerships with national allies, we’re standing strong to protect public lands. When the Trump Administration and Secretary of the Interior Ryan Zinke opened a “review” of more than two dozen national monuments, including Washington’s Hanford Reach, Americans were shocked. The intention was obvious: scale back protections for these wild public lands, and undermine the Antiquities Act, one of our nation’s bedrock conservation laws dating back to President Theodore Roosevelt. Six months later, this fight now intensifies with the news that while some of these iconic places, including Hanford Reach, will be spared for the moment, President Trump today announced intentions to shrink both Bears Ears National Monument and Grand Staircase-Escalante National Monument to less than half their current size. A fierce legal battle will undoubtedly ensue, as presidents of both parties have lawfully created national monuments for over a century, rightly protecting our nation’s natural and cultural heritage. What’s more, the Antiquities Act does not expressly give the Executive Branch the power to shrink or rescind national monuments, only Congress has clear authority to do so. As for public sentiment, the American people spoke loud and clear during recent comment periods, with more than 90 percent of respondents voicing support for preserving national monuments. For many of us in the Pacific Northwest, this is both a wake-up call and a call to action. Public lands—lands that provide vital habitat, priceless heritage and should be open to all Americans for sustainable use and enjoyment—are under attack. Pivotal environmental laws, policies and agencies are being threatened by both President Trump and radical Members of Congress. Powerful special interests and extremists are still working to “transfer” or privatize our public places. The national monuments “review” continues a disturbing trend of places once thought permanently preserved, even sacred, potentially on the auction block. We’re not going to stand aside and let this happen. Spurred by uncertainty over the future of public lands and working in partnership with other groups including The Wilderness Society, Defenders of Wildlife, Cascade Forest Conservancy and Washington Wild, in June 2017, Conservation Northwest organized the Washington Public Lands Defense Network to coordinate grassroots groups and individuals fighting to keep public lands in public hands. In the past, those fighting to protect public lands had cohesive and accessible networks to share information and strategize around key environmental issues. While such networks remain intact at the national level among organizations and expert advocates, in recent decades, grassroots connections have become fragmented in many states, including Washington. This new network aims to provide an open forum for those working to protect public lands in Washington, facilitating discussion, coordination and engagement between folks ranging from local chapter leaders to paid staffers and conservation lobbyists. In the face of today’s threats to public lands and vital environmental policies, it’s essential that our movement be reinvigorated and expanded to include diverse groups and communities, both urban and rural. We must also work to fully utilize the passion and capacity of not just organizations and experts, but all the people living, working and playing on and around our wild public places. With these goals in mind, my work over the past four months has been to reconnect old organizations and connect with new groups—from outdoor recreationists and hunting and angling groups to conservationists, civic and community leaders—to ensure protecting public lands is a top priority for our state’s elected leaders at all levels. This type of work isn’t new for Conservation Northwest. Our WILD NW Action Alert program has shared nearly 300 alerts over the past decade, each connecting our community of 10,000 activists with important regional issues. In recent years, we’ve been at the forefront of rebuilding the public lands movement in Washington, from coordinating a “Public Lands for All” rally in Seattle during the armed takeover of the Malheur National Wildlife Refuge in 2016, to working with other groups to produce videos and action alerts about the need to protect America’s public lands. When Hanford Reach National Monument was put on the chopping block, we were one of the first and loudest local organizations to speak out encouraging everyday Washingtonians and elected leaders to protect this special place. As further actions have continued to jeopardize our public lands, it’s only natural that we continue to defend these cherished public places, in the Evergreen State and beyond. The Washington Public Lands Defense Network now exists as an informal collection of regional, state and local organizations and grassroots leaders looking to share news, resources, and strategies to defend public lands across Washington state. Want to support our work for public lands in the Pacific Northwest? 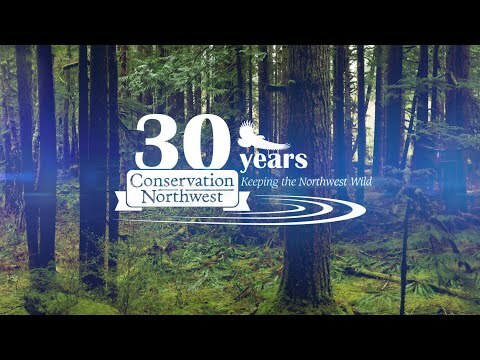 Please consider becoming a Conservation Northwest member for only $35 a year! As a state affiliate of the National Wildlife Federation (NWF), America’s oldest and largest conservation alliance, Conservation Northwest also maintains important connections to influential allies in Washington, D.C. and other parts of the country. This adds to our influence when we need to respond to local threats, while at the same time we strengthen NWF’s work protecting public lands at the national level. Through the Washington Public Lands Defense Network and other programs, we’re working hard to protect Washington’s public lands and the vital policies that safeguard them. America’s public land is inherently common ground. By bringing people together and bridging old divides, we’re making our movement stronger and more sustainable, and our elected leaders are paying attention. Together, we want to make sure Congress knows how important public lands are to us here in Washington and to our fellow Americans nationwide. One particular ally we have had in the fight to defend our natural resources has been Senator Maria Cantwell. Senator Canthwell has been a leader in pushing important public lands and forest health legislation, including provisions to improve funding for the U.S. Forest Service and restore forest resilience in the face of growing wildfires. Conservation Northwest and the Washington Public Lands Defense Network have been instrumental in applauding this conservation leadership. Please consider voicing your gratitude to Senator Cantwell—suggested comments are available on our website! If you have any questions or want to offer your services or support in defense of public lands, please contact me at hhutchison@conservationnw.org. More information about our work for public lands and other opportunities to write public comments and letters to your representatives is available on this webpage. Onward!